About Us - DnA Fitness | Personal fitness made for achieving your goals. Our philosophy at DNA FITNESS is personalized treatment, and we believe our studio also reflects this. Exclusively reserved for one-on-one or small group training, our intimate gym is spread over two floors. In the upstairs cardio room you will find treadmills, a stationary bike, an elliptical trainer, a stepper and a Jacob’s ladder along with a large open area with other equipment and free weights. Our downstairs weights room features all-new, state of art machines appropriate for beginners and advanced alike, whether your goal is weight loss, muscle gain or improved general health and fitness. For your comfort we have dressing rooms with lockers, gym towels and purified drinking water. 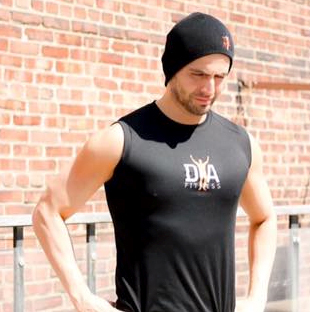 Founder of DNA FITNESS Danny Ugaldez is a certified personal trainer since 2004. As of his first year, he stands out when he was paid a special tribute during the annual convention at Énergie Cardio 2005, for his work done with clients. A moving testimonial from one of his clients read in his honor, earned him the credibility and the immediate recognition of his peers. Since then, his success continues to grow. Whether it be as a private trainer, consultant in physical activity (Énergie Cardio 2009) or coach on the road (California, Mexico, Vancouver ..), Danny shares his passion for training with all that have had the privilege to work with him. Whether for weight loss, muscle gain, progress in a specific discipline, physical rehabilitation, his motto is the same: with Determination, good Nutrition and a winning Attitude, we can achieve all our objectives with the physical conditioning. Melissa's passion for personal training stems from her 10 year career in gymnastics which has led her to be a member of Team Canada in 1997. She uses her personal training knowledge as well as her gymnastics background to help her clients reach their fitness goals. Melissa specializes in fitness competition training, pregnancy training , postpartum training, yoga and finally weight loss as she has gone through a 65 lb transformation herself. Moreover, she follows each clients nutrition on a daily basis through detailed apps, in order to teach them how to live a healthy lifestyle and make small changes to get there. According to her clients, Melissa is so encouraging during the training that it's actually fun to come and train! And the results... all her clients have obtained and surpassed their goals! Getting and staying in shape is rarely an easy task. For most, the struggle is real. Franco is no stranger to this fact. Having gone through his own personal transformation, he decided to pay it forward by helping others adopt a healthier more active lifestyle. As he often says: "It's never to late to start, but it's never too early either." A certified personal trainer, TrX instructor and group fitness instructor with over 5 years of experience, Franco, aka: "The Franzformer" has seen it all. He has worked with a full spectrum of clients specializing in functional movements, metabolize conditioning (HIIT) and strength training. His attention to detail along with his upbeat social attitude makes learning the basics or perfecting proper technique fun and informative. Coach Franco will help motivate and inspire you to push past your limits, get your body moving and heart pumping! Be ready to work and see results! © 2019 DnA Fitness. All rights reserved.